The film focuses on the daily lives of three women. All three are secretaries in Cape Town but come from different backgrounds. They share with us their approach to work and life in general, based on years of experience as organizers in chief. to face. Only one must survive with the money bag. Title: The spirit of the warriors. but the result is far from the expected effect . 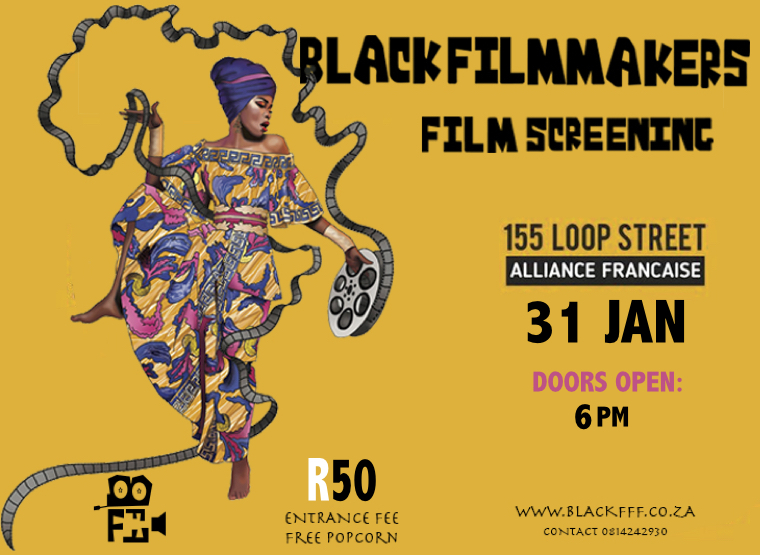 The Black Filmmakers Film Festival (BFFF) connects and showcases artists of colour from across the African continent and black diaspora through a series of events and workshops in the field of film and media. 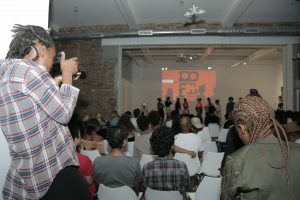 Through its various events, it seeks to establish itself as a principal port of call for aspiring black creatives, empowering them to realise their ideas in a supportive environment marked by mutual assistance and purposeful collaboration. 3. Annual Film FestivalFood and Refreshments will be for sell. 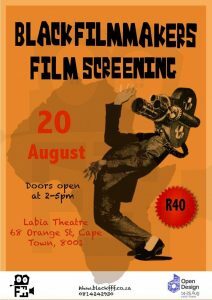 Cape Town screenings usually take place on the last Wednesday of the month. By ‘black’, we refer to everyone that would have been classified as ‘non-white’ under apartheid legislation. This includes African, Indian, Asian and Coloured people, i.e. those also referred to as ‘Biko black’. 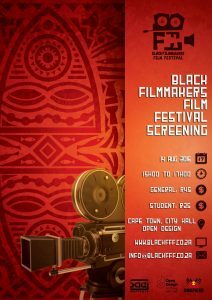 The Black Filmmakers Film Festival is driven by the need to amplify the voices of black filmmakers and support them in telling their own stories, essentially helping to transform the sector into a more inclusive business environment. Uncovering the careers of entertainers seldom heard from before: Black actors in Italian cinema dating back to 1915 when the first black actor appeared in an Italian film. BlaxploItalian cleverly discloses the personal struggles Afro-Italian, African-American, Afro-Caribbean and African diasporic actors face. 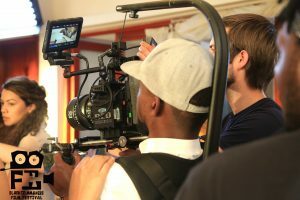 The stories serve as a call-to-action with the intention of challenging worldwide mainstream filmmakers and audiences for ethnic and racial diversity in casting for roles. The fight for diversity is not limited to the United States or the United Kingdom but is a global concern. Much like how #OscarsSoWhite exposed this problem to a new generation of filmgoers, BlaxploItalian is introducing audiences to precisely how global this issue is, starting with one of the last places you expect to find the African diaspora – Italy. A thought-provoking documentary which raises important question about the iconic leader’s legacy. How do people interpret Nelson Mandela’s message of freedom, forgiveness and reconciliation in today’s world of conflict and inequality? Matabane interviews the Dalai Lama, Henry Kissinger, Colin Powell, Peter Hain, Albie Sachs and Ariel Dorfman and discusses the effects his policies and decision-making had on shaping South Arica 20 years after democracy. As another year of excellence in Black filmmaking is drawing to a close, we have curated a final and rather special installment just for you. 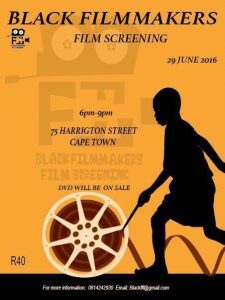 This month’s screening will take place in the spirit of giving as we hand over the Best Film Award 2016. Along with a special line-up of new films, we will also be taking time to rewatch 7 films selected from over 70 films screened this year, in order to give you the opportunity to vote for BFFF’s ‘Best Film of 2016’. Malaika Aminata Clements is a freelance life experiencer whose ultimate purpose is to promote self-acceptance and understanding through creative expression. Through OurNature, a creative catalyst co-founded by Malaika in 2010, she aims to build community by creating spaces where genuine human interaction can take place. Malaika will be in attendance and will field questions about her moving work in the Q&A! A TOTAL OF 10 FILMS TO BE SCREENED!!!!! 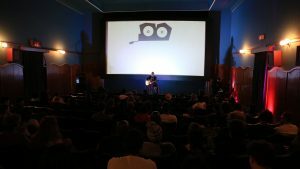 We invite you to come join us at Alliance Française du Cap, a venue which is known to provide a unique cinematic experience for our monthly screening. There will be a cash bar and some Ethopian Cuisine for your enjoyment. We will have wine from Stellar Organic Winery, South Africa’s largest producer of fine organic wines. Also, we are very happy to announce our new friendship with Juicebox, locally juiced using locally farmed fruits. 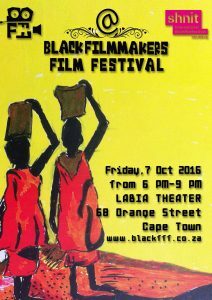 It is of great pleasure to invite you to our mini installation at this year’s Shnit International Shortfilmfestival Playground Cape Town on Friday, 7th October 2016. 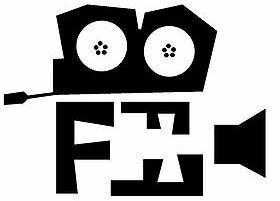 We as Black Filmmakers Film Festival are a collective of black filmmakers who seek to connect black filmmakers across the globe as a ‘support group and being part of the evolution of the film sector into a highly inclusive business environment for all people of colour/race. Our mission is to become a port of call for and empower black Filmmakers who want to realize their ideas, fostering an environment of mutual assistance and collaborations. We are highly honored for Shnit International Shortfilmfestival inclusion of Black Filmmakers Film into the festival programme and are appreciative of their recognition of our initiative. After the film screening you are invited to Chez Ntemba VIP Club – Cape Town on Buiten Street for our After-party where we will be enjoying more African sounds. Come join us for a all female Director film list which showcase current to matters. 3 – Foxy Five by Jabu Newman (This is exciting as it will be the premiere of the 3rd episode). This will be the first screening of our City of Colour project in partnership with SAE. 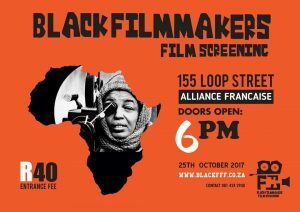 Our next screening in Cape Town takes places on the 31th of Sept 2016 at 6pm at 6 spin street Tickets are 40 ZAR at the door. The Black Filmmakers Film Festival, your favourite monthly screening of African movies connects deeper with the heart of African arts and hospitality by launching the Ndim Ndim project. 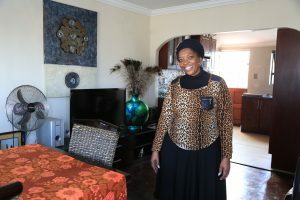 The Gugulethu lounge invites you into the homes of six families, where you will be exposed to a unique cinematic experience that involves inspiring short films made by renowned Kenyan Director, Jim Chuchu and thereafter be treated to South Africa’sfamous Chisa Nyama braai. 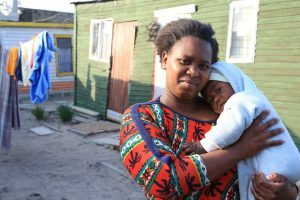 The event will take place on September 3rd from 11am to 14h00 in Gugulethu. Transport will be provided for those attending. 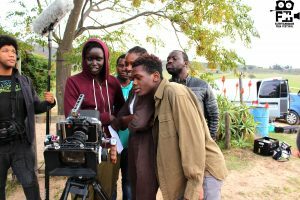 Kenyan Director, Jim Chuchu alongside his creative counterparts, The NEST Collective will provide us with an anthology of five short films, depicting true stories of queer life in Kenya. 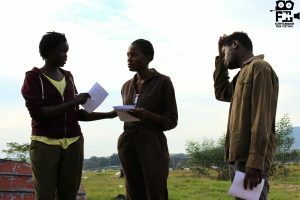 The film was rejected for distribution and screening in Kenya by the Kenya Film Classification Board, on the grounds that the film was considered to “promote homosexuality, which is contrary to national norms and values”. Executive producer George Gachara was subsequently arrested on charges of violating the country’s Films and Stage Plays Act. Money raised will be going directly to the families whose homes you were welcomed into, as well as funding film projects made by local upcoming filmmakers. Brought to you in proud cooperation with the African Screen Network. Transport pick up point to be announced. Ticket prices include transport, food and one complimentary drink. We used to go to the bioscope here in NY 6 near Gasela. Maybe you were not born by that time. I remember walking past with my grandmother, when we were coming from church, that day it ended late. So walking past the bioscope, I saw people sitting down, there was a big screen, I saw horses. As I was walking behind my grandmother, I saw her running, so I started running too, thinking we were being chased by the horses only to find out it was the bioscope. That’s the true story. This house belonged to my mother’s mother. I have great memories of growing up in this house, because we were a big family. We used to have only a few beds, so we would sleep on the floor on a mattress. All the kids would sleep here on the floor, the youngest would sleep with my grandmother in the bed and my uncles would sleep in the kitchen. Those times were great. Of the family members I grew up with, some have passed on now, so I am now the mother of the house and I am doing what was done by my grandmother then. I have two sisters who also do the same in their household, my one sister is in Gauteng. She is alone that side, I’m alone this side. I never went to a bioscope but when I was at school on some Fridays, we would be allowed to wear casual clothes and then there would be a film screening. We would put in money, so that we could wear casual and have a screening. We would then all sit in the school hall, were films would be shown, we would then watch till we had to go home. So we had bioscope at school so to say. Everyone will have the opportunity to experience a bioscope for those who don’t know what it is. How it is done, why it is a bioscope etc. I see this as a great thing for other people as well as for me. It will remind me of how I experienced it at school, that there are other ways to do it.